Soyuz capsules in assembly hall. First simultaneous flight of three manned spacecraft. The spacecraft was to have docked with Soyuz 7 and exchanged one crew member from each spacecraft while Soyuz 6 took film from nearby. However rendezvous electronics failed in all three craft. AKA: Granit (Granite). Launched: 1969-10-13. Returned: 1969-10-18. Number crew: 2 . Duration: 4.95 days. The spacecraft was to have docked with Soyuz 7 and exchanged one crew member from each spacecraft while Soyuz 6 took film from nearby. However failure of rendezvous electronics in all three craft due to a new helium pressurization integrity test prior to the mission did not permit successful rendezvous and dockings. Officially the mission was to test spacecraft systems and designs, maneuvering of space craft with respect to each other in orbit, and to conduct scientific, technical and medico-biological experiments in a group flight. Recovered October 18, 1969 10:19 GMT. Family: Manned spaceflight. People: Shatalov, Yeliseyev. Country: Russia. Spacecraft: Soyuz 7K-OK. Launch Sites: Baikonur. Agency: MOM. 1969 February 10 - . Soyuz plans - . Nation: Russia. Related Persons: Belyayev, Beregovoi, Bykovsky, Leonov, Nikolayev, Popovich, Shatalov, Titov, Tregub. Program: Soyuz. Flight: Soyuz 6, Soyuz 7, Soyuz 8, Soyuz s/n 15+16, Soyuz sn 14. Spacecraft Bus: Soyuz. Spacecraft: Soyuz 7K-OK.
1969 August 21 - . Final crew selections are made for the Soyuz 6, 7, 8 flights. - . Nation: Russia. Related Persons: Khrunov, Kuklin, Nikolayev, Sevastyanov, Shatalov, Yeliseyev. Program: Soyuz. Flight: Soyuz 6, Soyuz 7, Soyuz 8. Sevastyanov and Nikolayev did poorly on the final test for the 7/6 crew. Therefore Shatalov and Yeliseyev have been selected. Khrunov has been in an auto accident, and Kuklin didn't pass his centrifuge tests - so they're out as well..
1969 August 26 - . Soyuz 6-7-8 are slated to fly in the first half of October. - . Nation: Russia. Related Persons: Borman. Program: Soyuz. Flight: Soyuz 6, Soyuz 7, Soyuz 8. Spacecraft Bus: Soyuz. Spacecraft: Soyuz 7K-OK.
Tests of the spacecraft at Baikonur showed 40 to 60 defects, requiring replacement of 17 to 25 equipment items. This demonstrates the poor quality of final assembly and test at TsKBEM and inadequate measures to protect the spacecraft during storage and transport to the launch site. Soyuz 6 is to launch on 4-6 October, followed by another spacecraft each day thereafter. Nixon has invited two cosmonauts to visit the USA in November -- this is seen by Kamanin as the work of Borman to reciprocate for his visit to the USSR in February. 1969 September 12 - . Shatalov and Yeliseyev are progressing well for their Soyuz 8 flight. - . Nation: Russia. Related Persons: Nikolayev, Shatalov, Tereshkova, Ustinov, Yeliseyev. Program: Soyuz. Flight: Soyuz 6, Soyuz 7, Soyuz 8. Kamanin advises Nikolayev his chances of being named to fly Soyuz 8 are very low. Tereshkova arrives at Kamanin's office in the evening. She is infuriated that her husband is not to be allowed to fly the mission. She says she will take the matter to Ustinov and Polanskiy. Kamanin tells her that would be a mistake. 1969 September 18 - . Soyuz 6/7/8 go-ahead - . Nation: Russia. Related Persons: Mishin, Smirnov. Program: Soyuz. Flight: Soyuz 6, Soyuz 7, Soyuz 8. Spacecraft Bus: Soyuz. Spacecraft: Soyuz 7K-OK.
Approval is given for proceeding with the Soyuz 6-7-8 flights - . Nation: Russia. Related Persons: Afanasyev, Sergei, Beregovoi, Kuznetsov, Nikolai F, Nikolayev, Smirnov. Program: Soyuz, Lunar L1, Lunar L3. Flight: Soyuz 6, Soyuz 7, Soyuz 8, Soyuz n 17, Soyuz n 18, Soyuz n 19, Soyuz n 20. Spacecraft Bus: Soyuz. Spacecraft: Soyuz 7K-L1. However the board makes a big fuss over Kamanin having trained only four back-up cosmonauts to support eight prime-crew cosmonauts. A follow-up meeting is held with Smirnov and Afanasyev at 19:15, where Kamanin's training is denounced as a big failure. Nevertheless at 22:00 the word comes from the Kremlin to proceed with the missions. Kamanin points out that simultaneously with this mission he had cosmonauts in training for Soyuz s/n 17, 18, 19, 20 (Kontakt missions) and L1 circumlunar fights. Kuznetsov, Beregovoi, and several other cosmonauts are also enraged with Kamanin for bumping Nikolyaev from the Soyuz 8 crew. Kamanin maintains that in the circumstances he only had enough training resources for 8 prime + 4 back-up crew, especially for a mission scenario that would not be flown again in the future. 1969 September 22 - . Kamanin arrives at Tyuratam at 15:00 aboard an An-124 - . Nation: Russia. Program: Soyuz. Flight: Soyuz 6, Soyuz 7, Soyuz 8. A second arrives 50 minutes later. They bring the 49-strong VVS contingent for the Soyuz 6-7-8 state commission. The other members of the commission arrive aboard an Il-18. 2 to 3 weeks earlier an epidemic of dysentery swept the cosmodrome. This was a danger to the space flight crews -- no one showing signs of carrying the disease were allowed near them. They were isolated in special areas and only cleared trainers were allowed access to them during the outbreak. In the evening the American film 'Good Arrangement' is shown, the story of a husband in the role of a nanny for three children. 1969 September 23 - . LV Family: Proton. Launch Vehicle: Proton-K/D. Two Volga buses transport the cosmonauts and VVS specialists to Area 31. - . Nation: Russia. Related Persons: Beregovoi, Chelomei, Mishin. Program: Luna. Flight: Soyuz 6, Soyuz 7, Soyuz 8. Spacecraft Bus: Luna Ye-8. Spacecraft: Luna Ye-8-5. To ensure the buses do not exceed 60 km/hour checkpoints are manned along the roads. The readiness review is conducted form 10:00 to 13:00. The crews, and spacecraft are ready. Mishin is away 'sick' again. General Pushkin and Beregovoi are at Area 81 to view the Ye-8-5 launch. Kamanin likes Chelomei's UR-500K rocket. He blames its series of failures on its engines and Block D upper stage, not on the fundamental booster design. If it had been more successful, the Russians would have beaten the Americans in a lunar flyby. The launch proceeds as planned at 15:00, but the Block D fails to restart in parking orbit, and is given the cover name 'Cosmos 300'. 1969 September 24 - . LV Family: Proton. Launch Vehicle: Proton-K/D. Ye-8-5 failure analysis - . Nation: Russia. Related Persons: Savin, Smirnov, Tyulin. Program: Luna. Flight: Soyuz 6, Soyuz 7, Soyuz 8. Spacecraft Bus: Luna Ye-8. Spacecraft: Luna Ye-8-5. The cause of the Ye-8-5 failure is found to be a valve that was stuck open after the first stage burn, resulting in the oxidiser boiling away in the vacuum of space. Tyulin inquires about the possibility of commanding the Ye-8-5 to conduct a series of manoeuvres and testing re-entry of the soil return capsule in the earth's atmosphere. An interesting concept, but the engineers have not planned for such an eventuality. NII-2 MO, represented by Lt General Korolev and Chief Designer Savin present plans for their Svinets experiment. It will observe ICBM rocket plumes from space in order to aid design of anti-ballistic missile systems. They had asked Smirnov to conduct a solid propellant rocket launch in order to test the device properly, but he could only schedule a liquid propellant rocket launch. Kamanin had wanted this experiment to be conducted aboard Voskhod 3, but Smirnov has cancelled that mission as well - delaying Soviet ABM development, in Kamanin's view. 1969 September 24 - . Soyuz 6-7-8 readiness review is made by Ustinov, Kerimov (for Afanasyev), Mishin, and Karas - . Nation: Russia. Related Persons: Karas, Kerimov, Mishin, Smirnov, Ustinov. Program: Soyuz. Flight: Soyuz 6, Soyuz 7, Soyuz 8. Spacecraft Bus: Soyuz. Spacecraft: Soyuz 7K-OK. The members do not believe the three spacecraft and crews are ready for flight. They rate the availability of the actual spacecraft for training before the flight at 20 to 30%, while the trainers are being used at 200% of their rated capacity. The result is the cosmonauts can only train on the technical systems of the actual spacecraft after they have been delivered to the cosmodrome. The situation is even worse with the experimental equipment for the flights, which in some cases they do not see until they are at the cosmodrome. Unwilling to commit themselves, the commission bumps the decision whether to proceed up to the Politburo. Ustinov and Smirnov badly guide the whole space program, in Kamanin's view. The Politburo won't meet until 29 September -- he hopes the Russian bureaucracy can complete all the steps to approve the flights before the scheduled launch day! 1969 September 25 - . The Central Committee debates plans for the upcoming visit of two cosmonauts tot he USA. - . Nation: Russia. Related Persons: Belyayev, Beregovoi, Feoktistov, Nikolayev. Program: Soyuz. Flight: Soyuz 6, Soyuz 7, Soyuz 8. They rule out 22 October as a start date, in order not to have the embarrassment of them being there during the Apollo 12 mission. They reject Belyayev and Shatalov as candidates for the trip; they want Beregovoi and Belyayev or Beregovoi and Feoktistov. Kamanin opposes Feoktistov, and doesn't' want Beregovoi diverted from his work as cosmonaut deputy-commander, where he feels he is doing well. He has started lots of good new initiatives. Meanwhile Nikolayev continues to make trouble for Kamanin in regard to being bumped from the Soyuz 8 crew. 1969 September 27 - . 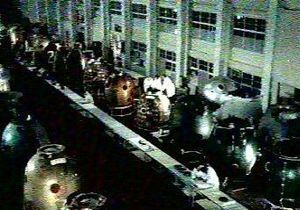 Fuelling begins of Soyuz 6. - . Nation: Russia. Program: Soyuz. Flight: Soyuz 5, Soyuz 6, Soyuz 7, Soyuz 8. Spacecraft Bus: Soyuz. Spacecraft: Soyuz 7K-OK.
V A Smirnov and other specialists again go over the near-disaster with Soyuz 5. The true cause of the failure of the re-entry capsule to separate has never been established, but the separation systems have been fully reworked (latches, pyrotechnics, etc) and fundamentally improved. The improved system was used on Zond 7, but no flights have yet been flown with the new system on a Soyuz. A deadly spider is found at the sport hall. Many cosmonauts saw it for the first time, and it led to a discussion of the dangers of Central Asia. - poisonous spiders and scorpions. Kamanin also makes a pilgrimage to Area 2, visiting the Korolev cottage and Gagarin museum. 1969 September 28 - . Soyuz 6-7-8 flight preparations - . Nation: Russia. Related Persons: Nikolayev. Program: Soyuz. Flight: Soyuz 6, Soyuz 7, Soyuz 8. It is Sunday, but the cosmonauts are at work, training on the scientific equipment for the flight and preparing for the autonomous navigation experiment. Nikolayev is preparing the work plan for the launch of the first spacecraft. The cosmonauts have been working ten hours per day for weeks now without interruption. The use of a new anti-radiation vitamin preparation the cosmonauts will take during the flights is discussed. 1969 September 29 - . Soyuz 7 manual rendezvous proposed - . Nation: Russia. Related Persons: Anokhin, Shatalov. Program: Soyuz. Flight: Soyuz 6, Soyuz 7, Soyuz 8. Meeting with the crew commanders for the upcoming flights. The ship's logs/flight plans are reviewed. The draft flight plans provided by Anokhin at TsKBEM had many errors that had to be corrected. Shatalov proposes a method of making a more fuel-efficient docking on the flight - uncoupling the automatic system and accomplishing not just the final docking manoeuvres but the terminal rendezvous manoeuvres manually. The flight specialists agree to review the proposal. 1969 September 30 - . Politburo approves Soyuz 6/7/8 flight. - . Nation: Russia. Related Persons: Afanasyev, Sergei, Kutakhov, Mishin, Smirnov, Ustinov. Program: Soyuz. Flight: Soyuz 6, Soyuz 7, Soyuz 8. Ustinov, Smirnov, Afanasyev, Mishin, and Kutakhov appear before the Politburo and affirm the readiness of the spacecraft, boosters, and crews of Soyuz 6/7/8 for flight. Approval is given to proceed..
1969 October 2 - . 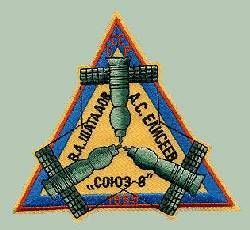 Soyuz 6/7/8 State Commission - . Nation: Russia. Program: Soyuz. Flight: Soyuz 6, Soyuz 7, Soyuz 8. The State Commission convenes at Tyuratam and affirms everything is ready for the Soyuz 6/7/8 flight..
1969 October 3 - . Mishin arrives at Tyuratam. - . Nation: Russia. Related Persons: Mishin. Program: Soyuz. Flight: Soyuz 6, Soyuz 7, Soyuz 8. Kamanin notes he now always shows up only after the State Commission has met..
Sunday at the cosmodrome - . Nation: Russia. Program: Soyuz. Flight: Soyuz 6, Soyuz 7, Soyuz 8. It is agreed that future pre-flight reviews of spacecraft operations should not just be limited to standard procedures, but should cover back-up and emergency procedures as well, even though this will take 2 to 3 days longer to prepare. It is Sunday at the cosmodrome. Kamanin gives a speech on the Gagarin launch in 1961. There are chess, tennis, billiards, and ping-pong tournaments. 1969 October 6 - . Soyuz 6/7/8 experiment review - . Nation: Russia. Related Persons: Mishin, Shatalov. Program: Soyuz. Flight: Soyuz 6, Soyuz 7, Soyuz 8. 1969 October 8 - . Soyuz 6/7/8 State Commission - . Nation: Russia. Related Persons: Grechko, Mishin, Shatalov, Volkov. Program: Soyuz. Flight: Soyuz 6, Soyuz 7, Soyuz 8. Kamanin takes General Efimov to see the roll-out of the Soyuz 6 booster. Mishin calls during the tour to ask that Volkov be switched with TsKBEM engineer Grechko on the Soyuz 7 crew. Kamanin refuses at this late date, noting in disgust Mishin is always pushing his staff for flight regardless of how it might affect the mission. Efimov is then taken to see the N1 MIK assembly building, the largest building in Europe. They view the construction of the 104-m-long booster's three stages. Next they go out to the pad, surveying the facility from 120 m up in one of the gantries. Kamanin muses that unless the N1 can be made reliable, the Russians will be 7 to 8 years behind the Americans in planetary and lunar exploration. Later the State Commission meets and fixes the launch schedule for the upcoming flights. Mishin does not raise the issue of Grechko flying to the commission. Shatalov is named commander of the entire three-spacecraft group flight. 1969 October 10 - . Cosmonaut awards discussed. - . Nation: Russia. Program: Soyuz. Flight: Soyuz 6, Soyuz 7, Soyuz 8. Bad weather at the cosmodrome - rain and 12-15 m/s wind. The traditional meeting of the cosmonauts and their support teams takes place at 15:00 at Area 31. Afterwards Kamanin meets with VVS General I M Moroz and Efimov. The future policy is that a cosmonaut will receive the Hero of the Soviet Union award and a military promotion only on their first flight into space. On later flights they will receive a lesser decoration and a cash award. Exceptions would be made for exceptional missions. Mozzhorin disagrees, preferring to keep things as they are. 1969 October 13 - . 10:19 GMT - . Launch Site: Baikonur. Launch Complex: Baikonur LC31. LV Family: R-7. Launch Vehicle: Soyuz 11A511. Soyuz 8 - . Call Sign: Granit (Granite ). Crew: Shatalov, Yeliseyev. Backup Crew: Nikolayev, Sevastyanov. Payload: Soyuz 7K-OK s/n 16. Mass: 6,646 kg (14,651 lb). Nation: Russia. Agency: MOM. Program: Soyuz. Class: Manned. Type: Manned spacecraft. Flight: Soyuz 6, Soyuz 7, Soyuz 8. Spacecraft Bus: Soyuz. Spacecraft: Soyuz 7K-OK. Duration: 4.95 days. Decay Date: 1969-10-18 . USAF Sat Cat: 4126 . COSPAR: 1969-087A. Apogee: 227 km (141 mi). Perigee: 201 km (124 mi). Inclination: 51.70 deg. Period: 88.70 min. 1969 October 14 - . Soyuz 7-8 docking problem - . Nation: Russia. Related Persons: Filipchenko, Gorbatko, Shatalov, Volkov, Yeliseyev. Program: Soyuz. Flight: Soyuz 6, Soyuz 7, Soyuz 8. Spacecraft Bus: Soyuz. Spacecraft: Soyuz 7K-OK.
1969 October 17 - . Landing of Soyuz 7 - . Return Crew: Filipchenko, Gorbatko, Volkov. Nation: Russia. Related Persons: Filipchenko, Gorbatko, Volkov. Program: Soyuz. Flight: Soyuz 6, Soyuz 7, Soyuz 8. Spacecraft Bus: Soyuz. Spacecraft: Soyuz 7K-OK.
1969 October 18 - . Landing of Soyuz 8 - . Return Crew: Shatalov, Yeliseyev. Nation: Russia. Related Persons: Afanasyev, Sergei, Karas, Kerimov, Mishin, Shatalov, Yeliseyev. Program: Soyuz. Flight: Soyuz 6, Soyuz 7, Soyuz 8. Spacecraft Bus: Soyuz. Spacecraft: Soyuz 7K-OK.
Kamanin's 61st birthday begins with a communications session with Soyuz 8. Yells come from the spacecraft. What's wrong? the ground nervously inquires. They reply they are only celebrating the successful closing of the hatch, and the glowing 'SA hermetic' indication on the panel. This ends fears they had all during the flight of not being able to get the hatch closed with the broken wheel spoke. The 145 second long retrofire begins at 11:29. It looks OK on the telemetry, but Shatalov reports on UHF that the indication aboard the spacecraft was that there was a 4 second underburn. Nevertheless the landing proceeds normally, and there is a loud 'Ura!' at the command point once word of a safe crew recovery is received - the mission is completed. Soyuz 8 landed at 09:10 GMT. At 16:40 the teams head back toward Moscow aboard an Il-18. Kamanin discusses the necessity to complete an extra 8 to 10 Soyuz spacecraft. He is supported by Afanasyev and Kerimov, but Mishin and Karas are opposed now. Kamanin thinks it is insane how Soviet space progress is blocked by these kinds of politics. Post mortem on the Soyuz 6-7-8 mission - . Nation: Russia. Program: Soyuz. Flight: Soyuz 6, Soyuz 7, Soyuz 8. Spacecraft Bus: Soyuz. Spacecraft: Soyuz 7K-OK.
State commission meets to do a post mortem on the Soyuz 6-7-8 mission. Kamanin gives a 15-minute briefing on the readiness of the crews for flight. He pointed to the need for more information and training on manual flight and navigation of the spacecraft, and more active use of the pilots throughout the mission. Then the commission acts out a few scenes of their meting for the press, television, and a documentary filmmaker. The Soyuz crews are undergoing medical exams at Area 17 at Baikonur. 1969 October 27 - . Cosmonauts tours. - . Nation: Russia. Related Persons: Beregovoi, Feoktistov, Khrunov, Popovich, Tereshkova, Titov. Program: Soyuz. Flight: Soyuz 6, Soyuz 7, Soyuz 8. Kamanin assigns cosmonauts to upcoming foreign propaganda tours. Beregovoi and Feoktistov are to go to the United States, Tereshkova to Hungary, Popovich to France, Khrunov to Odessa. Titov will not be given this privilege because of his numerous automobile accidents, run-ins with the militia, and motorcycle habit. 1969 November 3 - . Press conference preparations - . Nation: Russia. Related Persons: Keldysh, Mishin. Program: Soyuz. Flight: Soyuz 6, Soyuz 7, Soyuz 8. A meeting is held with Mishin and Keldysh to prepare the cosmonauts and other participants for an upcoming press conference. Kamanin notes a huge amount of time is spent in such preparations..
1969 November 5 - . Press conference - lunar project raised. - . Nation: Russia. Related Persons: Keldysh, Mishin. Program: Soyuz, Lunar L3. Flight: Soyuz 6, Soyuz 7, Soyuz 8. Major press conference. Keldysh dodges questions from American reporters on the Soviet lunar landing program. The cosmonauts perform all right, no mistakes. Kamanin views Keldysh as a braking force on the space programme. He attributes the loss of the moon race to bad managers like Keldysh and Mishin. 1970 April 10 - . Documentary film on the Soyuz 6-7-8 missions - . Nation: Russia. Program: Soyuz. Flight: Soyuz 6, Soyuz 7, Soyuz 8. Kamanin previews the documentary film 'Launch after Launch' on the Soyuz 6-7-8 missions..